Both the 12, 24 and 48Volt MS-E Magnasine Inverter Charger's are supplied with a fully functional LCD Remote Control Panel. A new generation inverter charger designed specifically for rugged recreational vehicle, marine or stand alone system use. ME-AGS-N The ME-AGS-N is the Network version of Magnasine Automatic Generator Start (AGS) controllers. This version is setup and operated via a Magnasine Inverter and ME-RC or ME-ARC remote panel. The ME-AGS-N has basic adjustments starting on battery voltage or temperature and has advanced start and stop settings based on: Time of day, Battery state of charge, Battery voltage, High temperature or Inverter load amps. Also includes the ability to manually turn the generator on and off, generator exercise, warm-up and cool-down. ME-AGS-S This Automatic Generator Start device is for stand alone use with no Combi system. Requires integration with MS-RC50 controller. 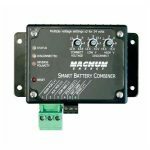 ME-SBC Smart Battery Combiner uses solid state control to direct the charge current from a single output Combi system to a secondary start battery. Charge current maintained at 25amps to secondary battery to prevent excess current and overcharging. ME-BMK The ME-BMK (Battery Monitor Kit) from Magnasine gives you a fuel gauge type of meter for your battery bank. It monitors the battery bank and reports the percentage state of charge, real time amps, voltage, amp-hours in/out, and the minimum/maximum DC volts. The ME-BMK includes the sense module, sense and communication cables plus a 500 amp shunt. ME-RTR The ME-RTR or Router provides parallel capability for the MS-PAE Series inverters and includes many of the same features as the ME-ARC advanced remote control. The router is designed with a user-friendly LCD display and rotary SELECT knob that allows all connected MS-PAE series inverter/chargers to be programmed in sync without the need to program each inverter separately. The router will accommodate up to four MS-PE inverter/chargers in parallel plus accessories. ME-MW-E The MagWeb allows remote monitoring of your Magnasine System via an Ethernet connection to your internet Router. An Internet connection and Router is required for this to work. You will require the Adobe® Reader® software installed on your computer to view these files. You can download the reader by clicking on the link below. Adobe® Reader® software is the free global standard for reliably viewing, printing, and commenting on PDF documents.